Having recently joined the LGMC chorus, I was impressed at the level of organisation, commitment and the energy that was being created in the room when all these people were singing together. After few hours’ rehearsals i could feel the vibrations all over the body. As an energy healer I cannot stop but notice how ones energy system changes during and after singing. If you think about it, sound is the very basis of music. Sound has an unseen penetrating power that compliments light, colour, fragrance and various energy healing techniques that Body Mind and Spirit therapists from various disciplines use in their day to day life to help people heal from various mental or physical disorders, regain balance, lift up their sprits, and facilitate the changes one wishes to make to in their life. The universe and everything in it is condensed energy that is vibrating and has sound. Your entire chakra system is made of light and sound. 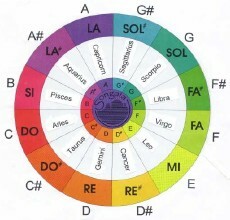 Each tone of the musical scale is believed to correspond to a specific chakra. Sound and tone have a powerful healing effect upon the body, mind and spirit as the sounds penetrate our energetic and physical field. It is recommended that chanting of the sounds of the chakras should be practiced in a comfortable posture, preferably seated on a mat or rug of organic material, with a lighted candle or oil lamp in the room. You can simply and spontaneously create and allow whatever sound wants to come out to come out or choose mantra , sets of sounds or words. Many people start with the vowel sounds. Support your deep breath with in your diaphragm. Feel the vibration of the tones throughout your body. Begin by grounding yourself first then allow sound to come out. There are many different ways of using sound in our lives. Bells, gongs, drums and chimes have been used for rhythmic and tonal work. Singing on the other helps open up not only your chakras but also our connection to our own self and our own spirit. For instance The Tibetan singing bowl is used to produce a continuous tone, these bowls are made of bronze or other bell metal. People may also prefer the tone of Crystal singing bowls which are made of fused quartz crystal, making them incredibly resonant. The tones produced by singing and crystal bowls are not just heard by the ear, you feel them in your body, and certain tones stimulate certain energy centers (chakras) and or organs in your body. Drumming is often a central component of the rhythmical use of sound as well. There is also a tonal use of sound, such as with singing bowls or sustained chanting. Examples of Tonal sound range from the powerful chants of Tibetan Monks, to the Gregorian chants of Christian Monks and even the speaking in tongues phenomenon found in an amazingly broad array of traditions.